Whew, its been a busy couple of days! After returning to the beach Tuesday evening, I have been spending some social time with friends. I have not had the camera out of the bag! Hit the grocery Wednesday morning and my long time friend, Sharlana Edgell, who is managing Director of the Seaford Historical Museum, met me here Wednesday evening, and we enjoyed a nice dinner out. She spent the night and we had fun sitting on the porch and catching up on life. After Shar left I did some home chores and ran up to Staples to get the router for my new Internet connection at the beach, and also stopped at Lowe's to get some paint and hardware to fix the damaged bathroom cabinet from the July renters. The next night, Teresa Sellitto a neighbor who sadly just sold her home here, and her friend Gerard Bailey, a bird photographer, and I enjoyed dinner Wednesday night at Harrison's in Ocean City. I shared some images with them after dinner and the Phillie's game. I asked him if he had a website and he doesn't but he does sell his images through a resource in Philadelphia. 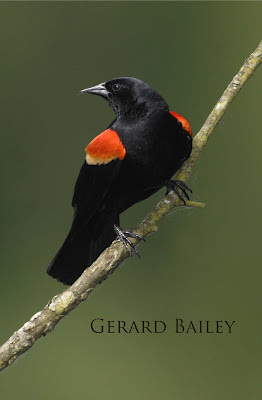 He sent me an image today of a Red-Winged black bird which is awesome. He also said in his e-mail, " You're a very talented photographer. You've got an eye for interesting subject matter to go along with your creative ability!" Wasn't that nice! I am going to share his image here, because it is so well done and I love bird photography. He shoots with a Nikon Camera and mostly a 600mm lens. Also got some good news, B&H Photo contacted me to join the affiliate photographer program. The B & H Photo badge on the right side of my blog is a search engine and link to B & H Photo, so if you have any interest hit it and see whats new at B & H Photo. I don't get anything for the hit, but will receive a little commission if you buy from them! and who doesn't? So when you want to surf B & H Photo, stop here first! More good news. My Intro to Digital Photography class at Johns Hopkins beginning on September 22 has sold out, and my Intro to Digital Photography 2 which starts in November already has 5 students registered. Looks like both classes will be full! Yeah. 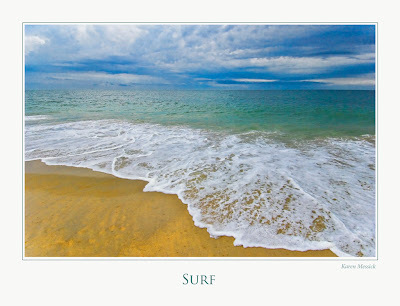 Plan on hitting the beach tonight with my camera again! So its been a good couple of days. Looks like Hurricane Bill is weakening and won't hit here, but there are warnings up for rip tides, and big surf. Could be some good shooting in the next couple days! Thanks for joining our affiliate program. We hope it's beneficial to us both. Your welcome Henry, I hope so too!